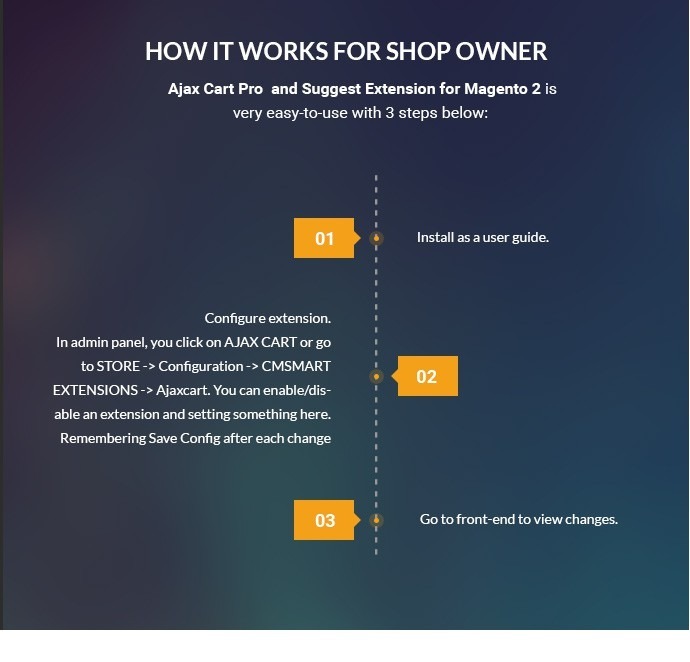 Ajax Cart Pro Extension for Magento 2 is the best function to allow customers shopping quicker and more convenient. Default Magento is not always optimized for all online shops. The long add to cart process annoys customers so Ajax Cart Pro Extension for Magento 2 is an excellent extension for users who hate constant page reloads. It helps them add, edit or remove products from Ajax pop-up easier without interrupting the shopping process. 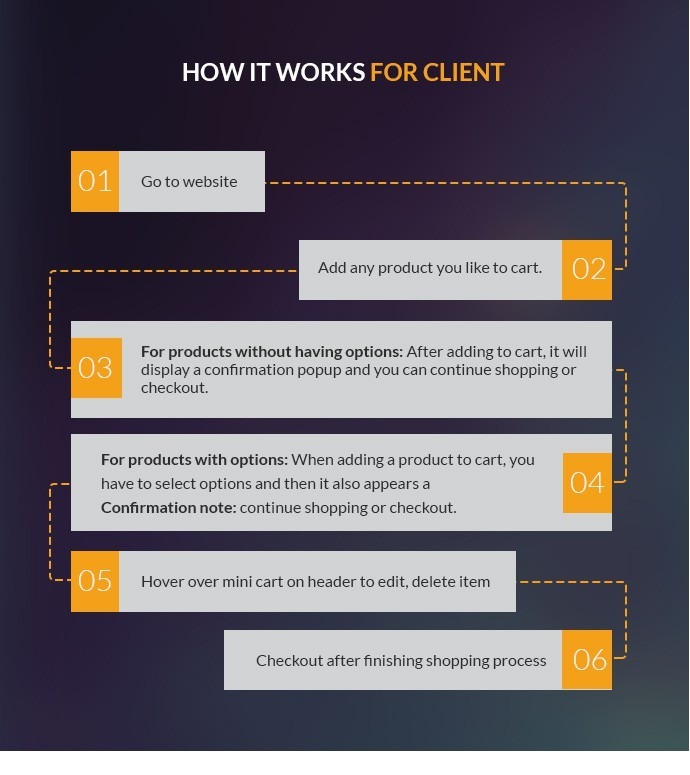 There are a lot of benefits for users as well as shop owner when integrated Ajax Cart Pro Extension on your e-commerce website. 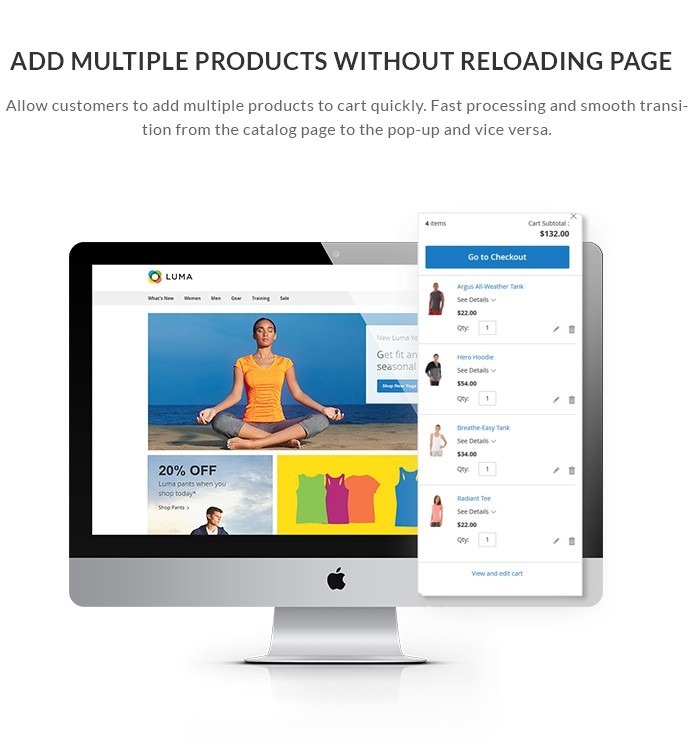 It saves shoppers a huge time on shopping without reloading pages. It also increases sales volume with higher conversion rates and customer retention. Besides, customers can explore catalog easier and enjoy a pro-level site. 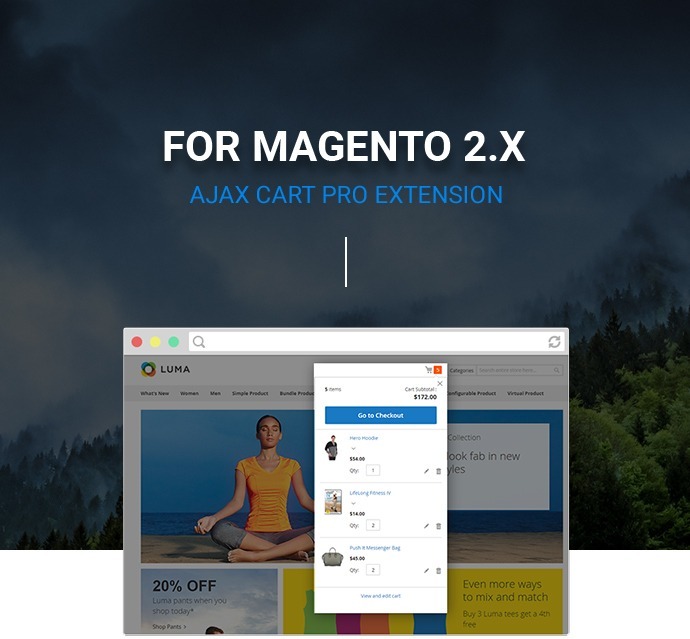 Moreover, Ajax Cart Pro Extension for Magento 2 works well with all types of products and it is totally responsive so your customer can purchase items anywhere and anytime. Beside, admin can configure theme colors simply as their favorite color in comfirmable popup from admin panel easily. Add any product you like to cart. For products without having options: After adding to cart, it will display a confirmation popup and you can continue shopping or checkout. 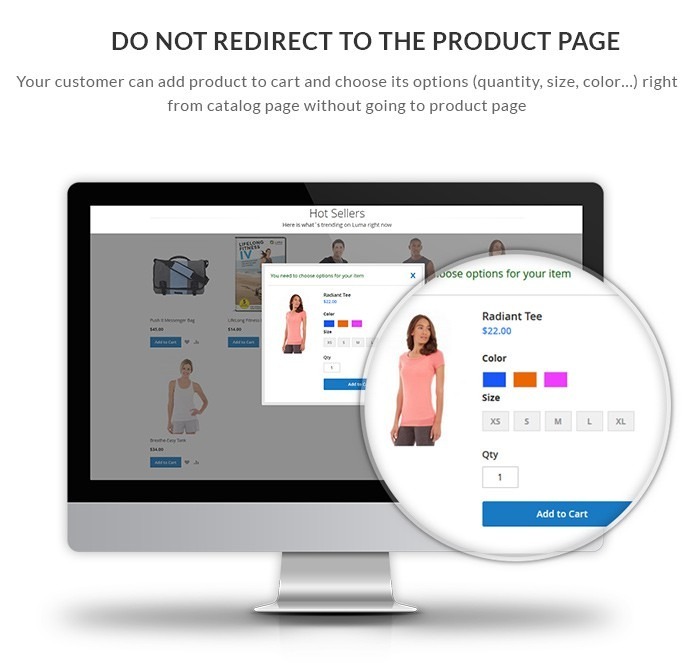 For products with options: When adding a product to cart, you have to select options and then it also appears a confirmation note: continue shopping or checkout. Checkout after finishing shopping process. Install as a user guide. Configure extension: In admin panel, you click on AJAX CART or go to STORE -> Configuration -> CMSMART EXTENSIONS -> Ajaxcart. You can enable/disable an extension and setting something here. Remembering Save Config after each change. Go to front-end to view changes. 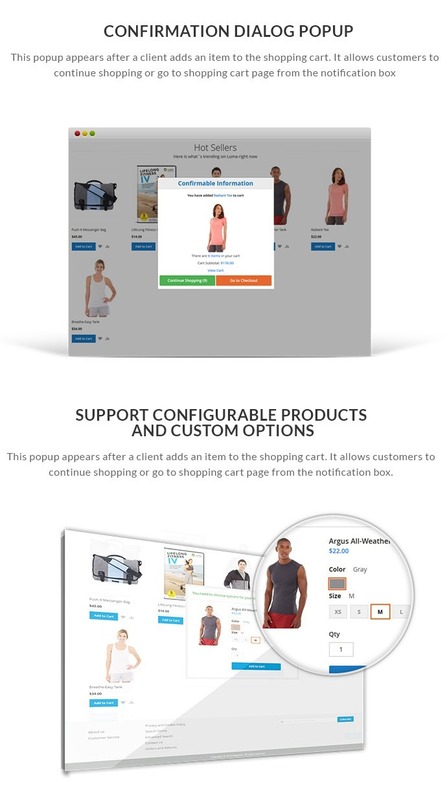 Support configurable products and custom options: AJAX cart is a pro solution that allows edit configurable products and select custom options right from the category page with the help of handy dialog window. It is possible to display all custom options or only required ones. 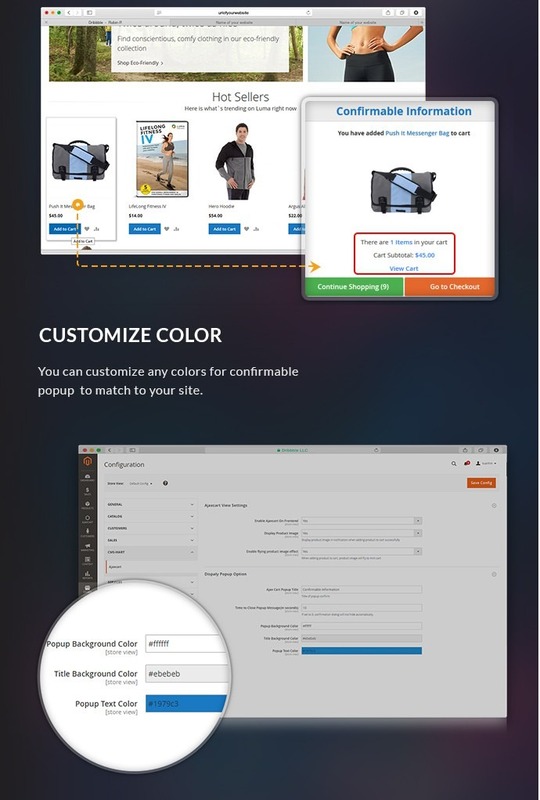 It saves your customers’ a lot of time without loading the detailed product view page. 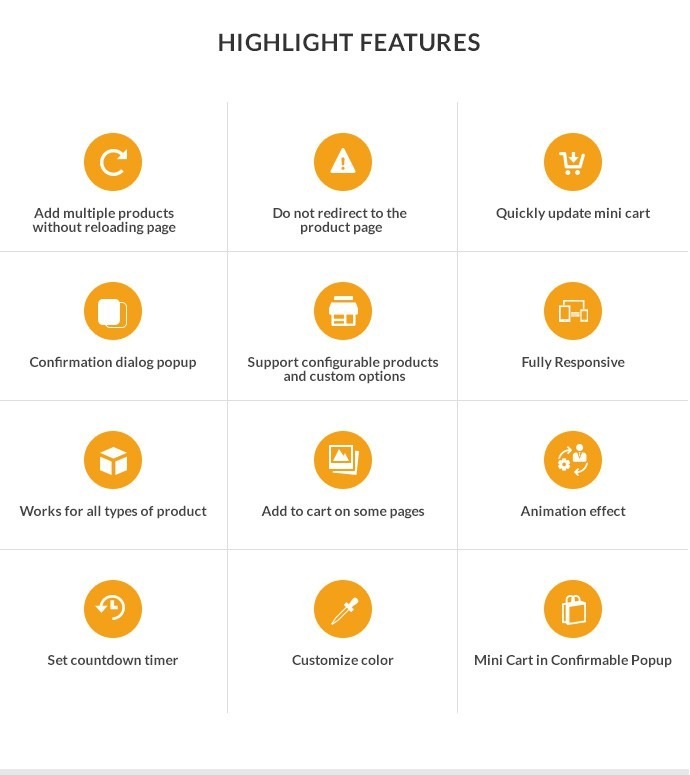 Works for all types of product: Ajax Cart Popup will work with all product as simple, configurable, bundle, downloadable, virtual and grouped products. This tool will make it much easier for our customers to shop. The service we received with this extension was amazing. Almost an instant reply & our request for customization was accepted with no hassle. Great company & extension. Does this extension allow adding multiple products? Yes, it does. 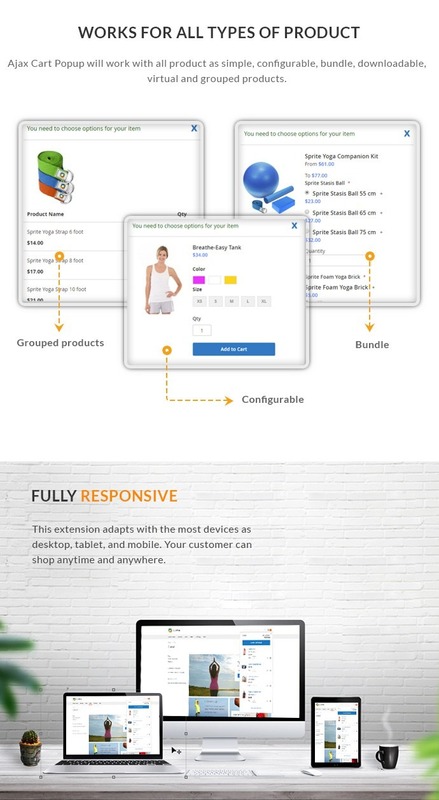 It allows customers to add multiple products to cart quickly. Fast processing and smooth transition from the catalog page to the pop-up and vice versa. Can I edit products from mini cart? Yes, you can. 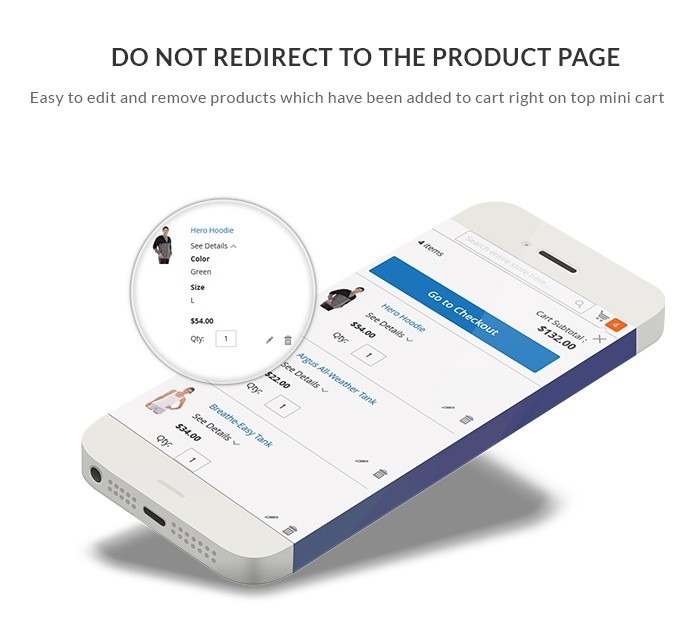 It is easy to update and remove products which have been added to cart right on top mini cart. Can I custom the confirmation dialog popup? Yes, you can, edit the text, color, back-ground in the mini cart. Or you can contact us to get the best support. What types of products that works well with this extension? Which pages that use this extension? Can I enable flying products image? Yes, you can. You can enable or hide the flying products image. How can I set up the count down time in the admin? You can always download the purchased items for lifetime as it still for sales status on the Cmsmart Marketplace. Please come to the Download section to immediately download the products right after payment. Our extension works well on Magento 2.2.6 so you don't worry about that. When you install this product on your site, if it has any issues, feel free to let us know. We will check and give you the feedback asap. Don't hesitate to contact me via Skype or WhatsApp to get the quick response. I am available to support you.